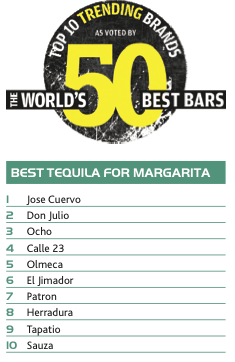 What can we say about the Margarita? Well, it’s the most popular cocktail in North America. Which some might find surprising since tequila is definitely NOT the most popular of the spirits categories in the world. But then how many drinkers actually know that a Margarita contains tequila? Well, that’s a whole different survey. It was first referenced under the name Picador in WJ Tarling’s Café Royal Cocktail Book in 1937. It appeared in print about 16 years later as the Margarita. Who copied who remains a history mystery. So how do you make a classic Margarita? Let’s look to Jim Meehan’s PDT Cocktail Book. Method: Shake with ice and strain into a chilled rocks glass filled with ice or a chilled coupe (optional salt rim). Garnish with a lime wheel. Margarita is Spanish for ‘daisy’, while a Picador is the chap who jabs the bull in bull fighting. It’s still growing, make no mistake – and we feel really quite excited about it. So excited in fact, that this year we decided to reinvent the way we conduct the artist formerly known as Hot Bar Brands by polling our very own top 50. A trending brand might not be doing the same volumes as a best-seller but it’s a brand that customers are increasingly asking for. We also included a couple of new categories this year – champagne and water – as well as expanding the cocktail questions to include the likes of aperitifs and after-dinner drinks. The idea is to paint as accurate a picture of what is being consumed in bars around the world as possible.